Priscilla A. Gibson-Roberts writes in "High Whorling" "Notches on the whorl are imperative in my opinion..." (page 33 in the 1998 edition). With all due respect to Gibson-Roberts, I do not agree. The purpose of the notch is to stop the yarn from sliding along the whorl's rim. In my experience, the yarn only slides when the diameter of the cop (the wound-on yarn) approaches the diameter of the whorl. In other words, when the spindle gets rather full. Depending on the diameter of the whorl and the weight of the spindle, this may never happen! If it does happen, it can be easily remedied: Spiral the yarn down the cop and wind it around the shaft below the cop, as shown in the photograph. 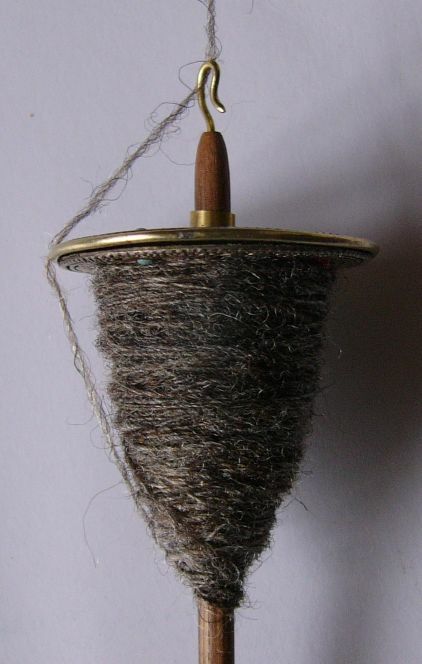 With this method I manage to get the pictured spindle (one of Golding's Nepalese Mandala spindles) so full that its weight becomes too high for the thin yarn I am spinning. Every now and then people ask: "When is a spindle full?" As with other questions in spinning, the answer is an unequivocal "It depends." I have to admit that so far I haven't managed to do that. I tend to spin as thin a yarn as the spindle weight allows and when I've added about two thirds of the spindle's weight to it, I feel that it is getting too heavy. But really, the question is not all that important: Sooner or later you need to get the yarn off the spindle. As I prefer to ply on a wheel I wind the yarn off the spindle onto a bobbin (the bobbin being in the wheel). This makes it very easy to spin the ends of the yarns (the one that is alrealy on the bobbin and the one that's on the spindle now) together so that I end up with a bobbin full of continuous yarn. Spinning the ends together is easier if you leave both ends of the yarn on the spindle unspun for a few centimeters. If you don't have a wheel, you can wind the yarn off the spindle into a ball and spin the ends together as well. Or you can spimply make smaller skeins - sewing the ends of the yarn together while knitting isn't a big deal either. In any case, if you are going on holiday with one spindle and plenty of raw fibre, it pays to plan ahead for when the spindle is full.